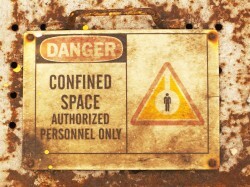 Confined space training is essential for anyone working in hazardous spaces. Soldiers in the US army station in South Korea have recently come together to participate in an extensive three day confined space training. Members of the 304th Expeditionary Signal Battalion and the 36th Signal Battalion spent the last few days of September at Camp Humphrey, near the city of Pyeongtaek in the Gyeonggi Province. The course was part of a new initiative tentatively entitled the Fibre/Cable University, which has been designed as a way of educating soldiers about correct confined space safety procedures. 501st Signal Company member Specialist Robin Williams said that the training was an improvement on previous training he has done, which had a tendency to be “rather boring”. “This training was much more fun as it enabled active participation on top of classroom-type training, and I am sure that most trainees share my view,” said Spc. Williams in a statement released by the US Army on October 10. Civilian experts were on hand at the training courses to ensure the safety of everyone involved. “Confined space training in a manhole with carbon monoxide gas can be dangerous. That’s why we also brought professional civilians along for support,” explained Staff Sergeant Damon Young. Of course, the US is not the only military that provides confined spaces training for soldiers – an ability to operate safely and efficiently within confined spaces is an important asset for members of the Australian armed forces as well. The official Australian Defence Jobs website states that Australian Commandos are required to “operate effectively and without signs of undue stress, panic or excessive fear when … in dark confined spaces”. Confined spaces training is also a prerequisite for many dangerous civilian jobs in Australia, such as any role that includes particularly hazardous cleaning, installation, maintenance or inspection duties.